There are loads of student lock-ins at the moment and I'm a little envious because my student ID expired in 2008. Where are my discounts and free goody bags? 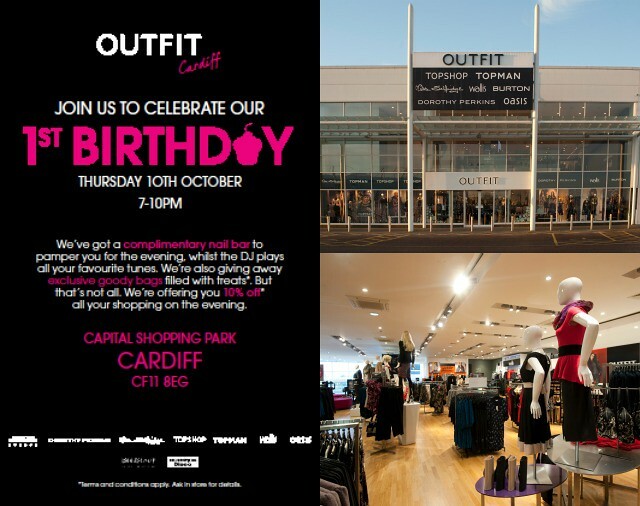 Well non students (and students) can rejoice because Outfit in Cardiff are having a 1st birthday bash this week and everyone is invited. Pop along to the store in the Capitol Shopping Park in Leckwith from 7pm for what looks like a very enjoyable evening. There's going to be a nail bar, DJs and most important 10% off all purchases. Are you going to attend? I've got my eye on a few Topshop tea dresses at the moment and might stock up on a couple of Burton shirts for my brother for Christmas.